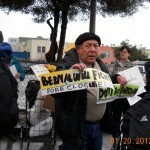 Occupy Bernal and supporters will protest today the foreclosure auction to stop the eviction of our neighbors Washington and Maria Davila. 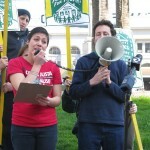 We will also leaflet potential home buyers, calling on them not to buy the Davila’s home. 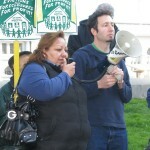 Washington and Maria Davila have been living in a house they have been renting in San Francisco’s Bernal Heights neighborhood for the past seven years. 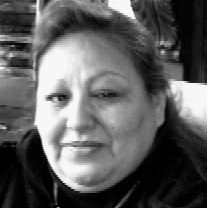 Because their Las Vegas landlord Felisa Yambao — who is suffering from cancer — is in foreclosure, Wells Fargo is planning to sell their house at auction today. 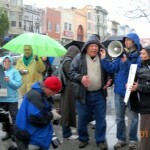 A new owner-occupant of the house could evict the Davilas and the Davilas would like to continue renting from Ms. Yambao. 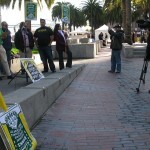 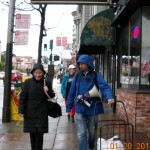 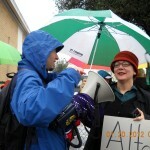 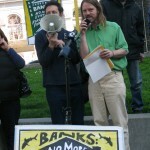 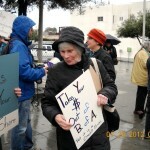 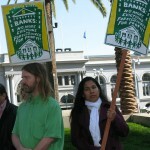 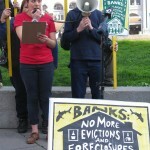 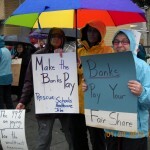 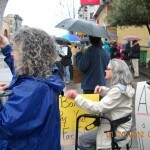 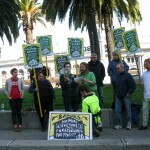 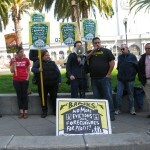 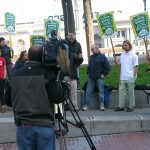 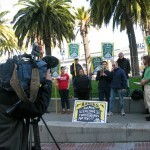 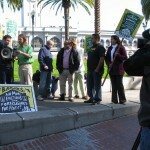 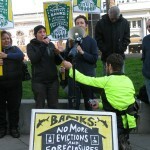 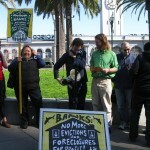 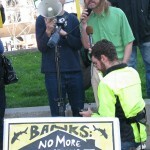 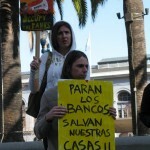 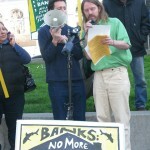 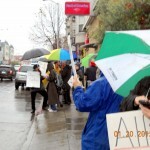 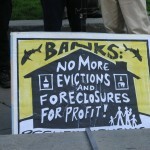 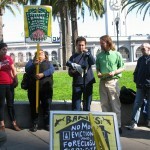 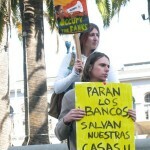 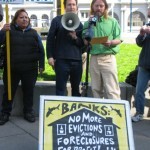 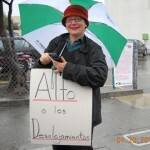 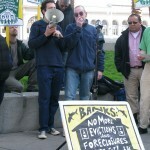 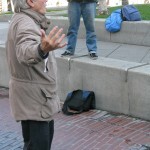 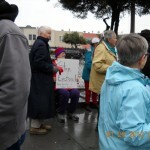 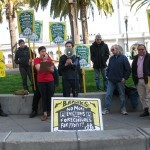 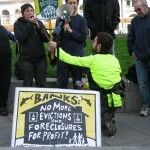 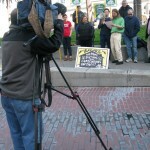 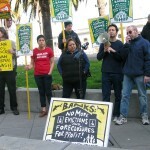 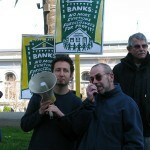 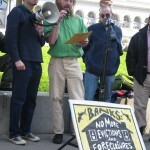 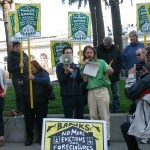 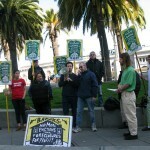 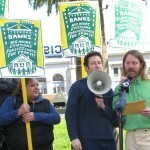 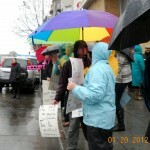 Last January 20, Wells Fargo canceled an auction date after Occupy Bernal planned a protest. 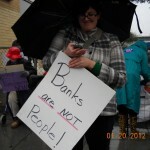 But the bank hasn’t learned its lesson. 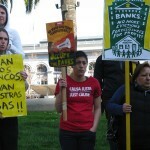 San Francisco, February 14, 2012 – Occupy Bernal and Occupy SF Housing today invite the 99% to join a campaign to stop Wells Fargo Bank from evicting and foreclosing on our neighbors and to defend all neighborhoods from predatory bank evictions, foreclosures, and foreclosure auctions. 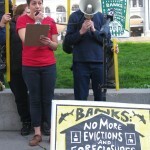 Occupy Bernal, the Alliance of Californians for Community Empowerment (ACCE), Causa Justa :: Just Cause (CJJC), and other community organizations in the Occupy SF Housing coalition are demanding an end to predatory, for-profit evictions and foreclosures by Wells Fargo in our neighborhood, in the city of San Francisco and beyond. 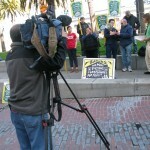 In conjunction with a Valentine’s Day “Dump the Banks” action organized by CJJC, Occupy Bernal and Occupy SF Housing invite the press to hear from San Francisco residents who the banks are unjustly foreclosing and evicting from their homes. 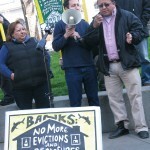 Speakers will include: Alberto del Rio, Occupy Bernal Foreclosure Fighter; Maria Zamudio, CJJC; Maria Davila, Occupy Bernal Foreclosure Fighter; Ted Gullicksen, San Francisco Tenant’s Union; Victor Granados, Occupy Bernal Foreclosure Fighter; a representative from ACCE; and Stardust, Occupy Bernal. 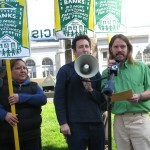 After the press conference, the press and the 99% are invited to join CJJC and friends in a march on the banks to let them know we’re dumping them. 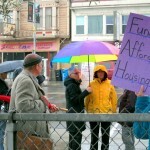 The CJJC invitation says: “They’ve broken our hearts, our homes and torn our families and communities apart.” The event will include street theater/teatro, music, and valentines for everyone to sign, as well as an opportunity for folks to move their money to community credit unions. 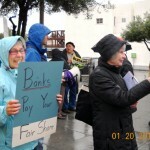 The recent deal between banks and the Attorneys General of 49 of 50 states is woefully inadequate and does little for the Californians hardest hit by the crisis. 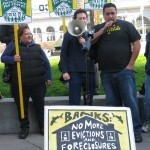 Foreclosures have cost the state $650 billion in lost home values, property taxes, and foreclosure-related costs, according to a report released by last December by California Reinvestment Coalition (CRC) and the Alliance of Californians for Community Empowerment (ACCE). 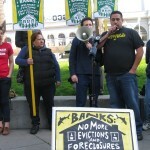 The top banks – Wells Fargo, Bank of America, JPMorgan Chase, Citigroup, and Ally Financial – pay only $18 billion in this sweetheart deal, which amounts to only $150 per foreclosure statewide. 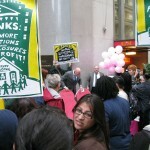 About 750,000 families will receive up to $2,000, a pittance compared with even the depressed value of their homes. 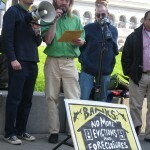 The largest chunk – more than $12 billion – will in part go to pressure even more homeowners to sell their homes for less than what they owe, in real estate transactions called short sales which are usually an easy way for banks to make money and save time, while leaving more and more neighbors without homes. 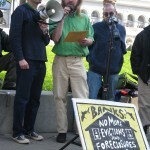 To summarize, the 1% are profiting off the economic distress of the 99% to finagle the largest land grab since the Depression era or earlier. 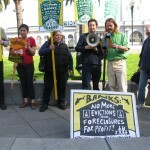 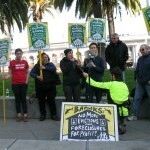 In a city that has seen as many as 12,000 foreclosures in the past three years, Occupy Bernal started organizing in December 2011 to stop the evictions and foreclosures of our neighbors, joining a community of housing rights organizations who have long been fighting for tenant’s and home owners’ rights. 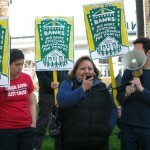 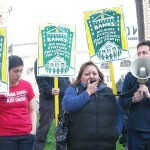 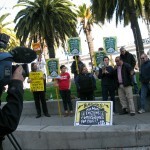 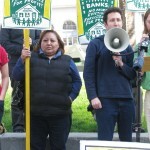 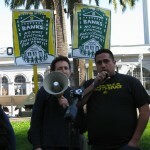 In response to public protest in January 2012, Wells Fargo Bank postponed auctions of the Bernal homes of Washington and Maria Davila and the Alberto Del Rio family, but the bank also rescheduled the auctions. 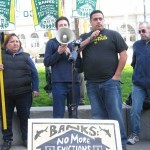 Despite meeting with six foreclosure fighters from the Bernal Heights neighborhood and another from Bayview-Hunters Point, Wells Fargo executives have refused to allow any to refinance their homes or modify their loans, and have continued plans to sell off their homes. 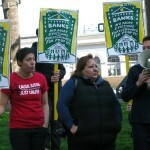 These protests follow on successful protests that shut down Wells Fargo headquarters on January 20, 2012, and Wells Fargo bank branches in the Bernal and Excelsior neighborhoods on January 5 and January 7 respectively. 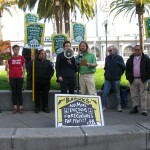 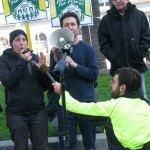 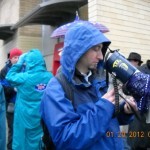 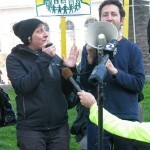 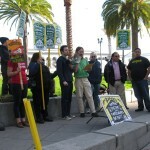 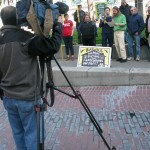 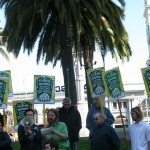 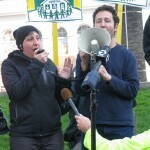 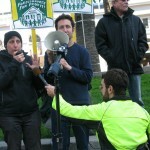 Occupy the Housing Auction: People’s Lives Are Not for Sale! 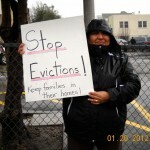 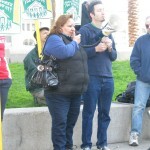 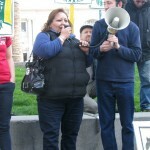 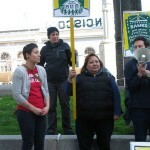 Stop the Eviction of Washington and Maria Davila! 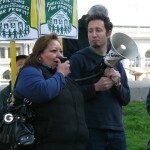 Friday, Jan. 20, 1:45 p.m.
Washington and Maria Davila have been living in a house they have been renting in San Francisco’s Bernal Heights neighborhood for the past seven years. 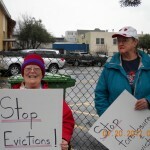 But now, because their landlord, who lives in Las Vegas and is suffering from cancer, is in foreclosure, Wells Fargo is planning to sell the house at an auction this Friday. 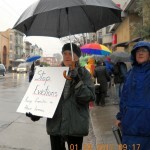 According to the Ellis Act, a new owner-occupant of the house could evict the Davilas. 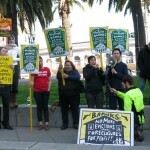 On Friday, as part of the Occupy Wall Street West day of action, Occupy Bernal is determined to disrupt the housing auction to stop the eviction of our neighbors. 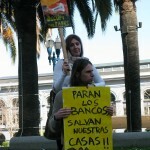 We also will be leafleting potential home buyers, calling on them not to buy the Davilas’ home. 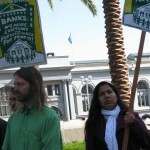 Join us as we occupy the steps of city hall! 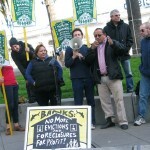 People’s lives are not for sale! 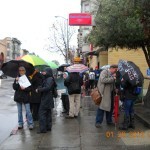 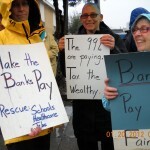 Join Occupy Bernal on January 20: Occupy Wall Street West! 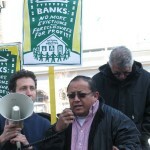 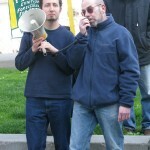 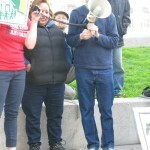 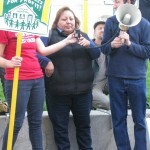 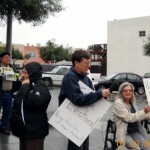 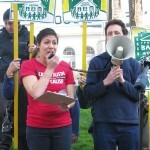 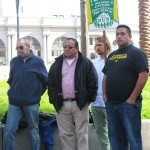 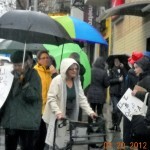 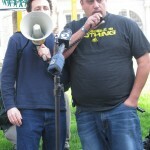 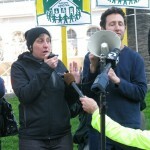 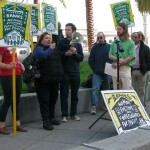 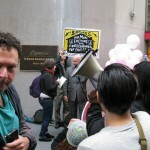 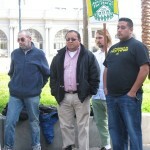 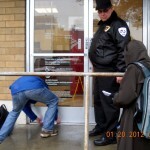 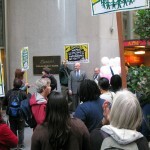 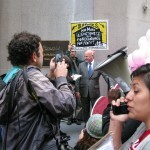 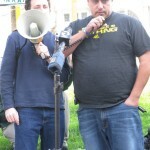 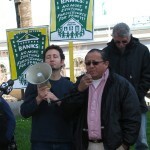 1:45 p.m.: Occupy the Housing Auction: Stop the Eviction of Washington and Maria Davila! 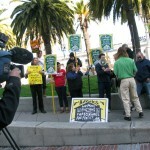 City Hall steps, rear (Van Ness) side. 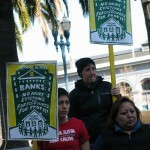 Transportation from Bank of America to the Wells Fargo on Mission St. will be available for those unable to march. 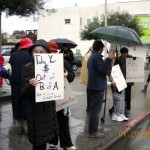 For more info, please contact info@occupybernal.org or www.occupybernal.org. 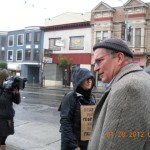 Phone: 415-483-9138.